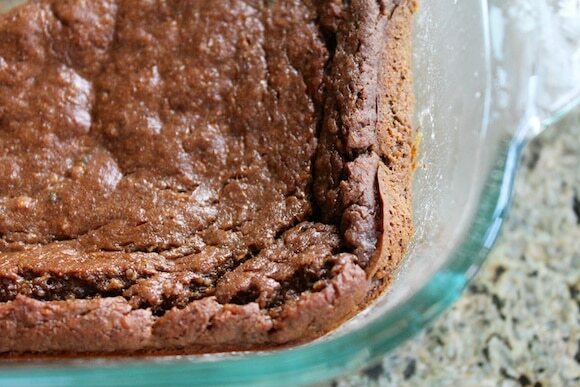 What could be better for breakfast than a healthy Pumpkin Breakfast Brownie? This one is made gluten- and dairy-free with lots of healthy fiber and protein. The big day is almost here…Thanksgiving! I’ve tried to offer some healthy ideas for your holiday table this year, whether you be a host with the most or a guest just needing to bring a dish or two. I mentioned before that I’m taking it low-key this year and just cooking for my husband and me. 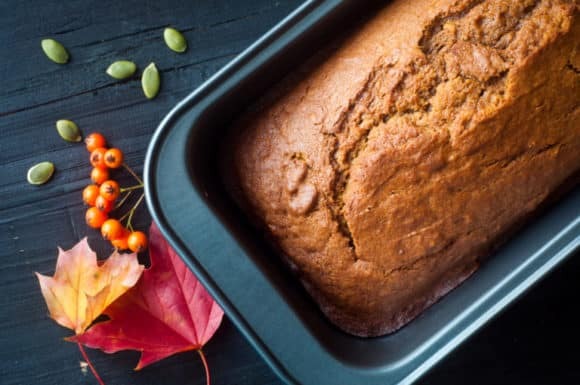 While I couldn’t be happier to have some breathing room and no expectations for anything fancy, I have two recipes for you this week that can be served as a special holiday breakfast or dessert. This recipe kind of reminded me a little bit of Black Bean Brownies where the texture becomes much firmer after cooling completely. 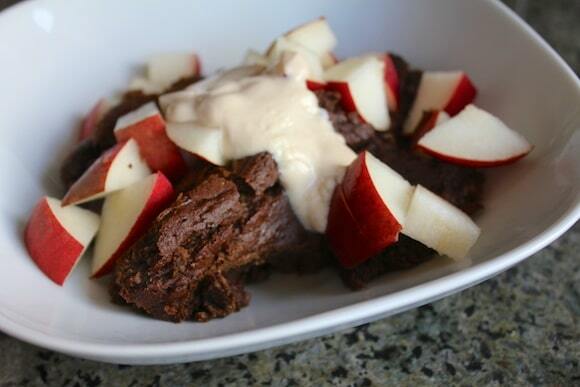 What could be better than a healthy breakfast brownie? Place the rolled oats in the bowl of a food processor on turn on high until finely ground, about 20 seconds. 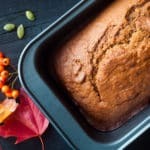 Add the pumpkin puree, almond butter, eggs, baking powder, currants or raisins, vanilla, ground flax, cinnamon, grated zucchini, non-dairy milk, and maple syrup and process on high until thoroughly combined. Use a spatula to scrape down the sides if necessary. Spray an 8 x 8-inch baking dish lightly with non-stick cooking spray. 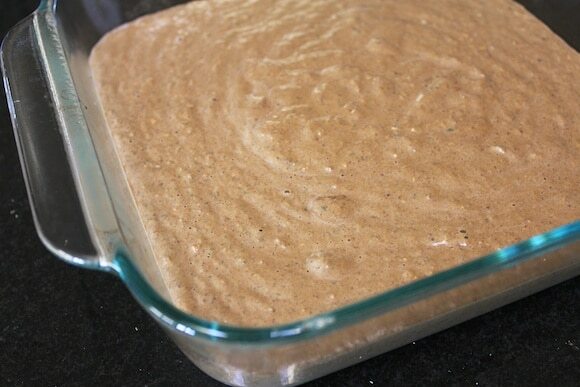 Pour the mixture from the food processor into the baking dish. Bake for 45 minutes or until the top of the brownies is firm and golden brown. Be careful not to burn. Serve hot with fruit and non-dairy milk or non-dairy yogurt. The texture will be soft, like a pudding. For a more traditional brownie texture, let cool completely or refrigerate overnight before serving. I struggled whether to call this recipe a pudding or brownies, but, ultimately, Pumpkin Breakfast Brownies just had a wonderful ring to it. They look so delicious, love the idea of a breakfast brownie! Brownies for bfast?? Yes please! These look so good AND I have all the ingredients! I have a green smoothie every morning for breakfast, but I find I really like to have something small on the side that I can sink my teeth into. I’m thinking of whipping up a batch of these and cutting them into very small squares to complement my smoothies. Thanks for the recipe! I can’t wait to try this recipe tomorrow. Good luck on your finals, I know you will do great! These look great I have all the ingredients except zucchini maybe I can sub bananas or apple sauce, or just grated apples . Zucchini season is long gone in my part of the country NJ. Good point, Kim! I forgot that it’s nearing winter in other parts of the country (oops). Let’s see, how about a mixture of grated broccoli stems and carrots? Thank you for the sub info, I made them with grated apples and raisins. They were delish, I also didn’t add the extra date sugar plenty sweet for me. They fill my need for something sweet and chocolate. I’m going to make them again today with grated carrots, raisins, and cashew butter, since that’s what I have on hand, could also add some nuts if one is inclined. Might be able to make a carrot cake like version. 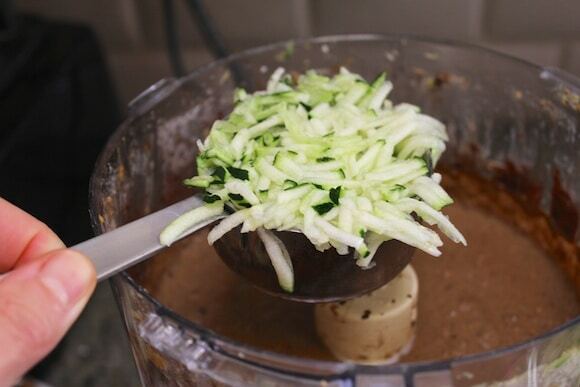 is it possible to mix this in a blender instead of a food processor? or what about if you have neither, can you mix by hand? also, can you substitute the date sugar for simply dates? or does this affect the consistency/hardness? Hi Sabina! Great questions. Well, you need a food processor to grind the oats into oat flour. If you want to use a blender, I think you might have some problems (just imagine making regular brownies in a blender). And, if you use regular dates instead of date sugar, you will need to pre-soak them if you are going to use a regular blender. I mean, you could definitely try these options including stirring by hand, but it’s going to require a lot more work, obviously. If you go that route, you could always buy oat flour, use regular sugar (or a liquid sweetener), and have your almond butter at room temperature for easier mixing. A hand mixer might be another good option. Let me know what you end up doing; I’d love have your feedback. Love these brownies anytime of the day!